Anytime you’re feeling low, take a walk in a flower garden and it’s sure to brighten your day! There are so many colors and varieties, with fragrances to delight your senses. If you’re lucky, you’ll spot a butterfly fluttering here and there from blossom to blossom! Now go to your crafting space, and create a flowery card for someone you care about. For this card, I used a retired set called Bloomin’ Marvelous because the images fit so well with the Tea for Two designer series paper and the oval framelits, and I love the sentiment. You could easily recreate it by changing out the colors and/or papers. Let’s see what you come up with! Leave me a comment and let me know what you’ve been working on. I’d love to hear about it! 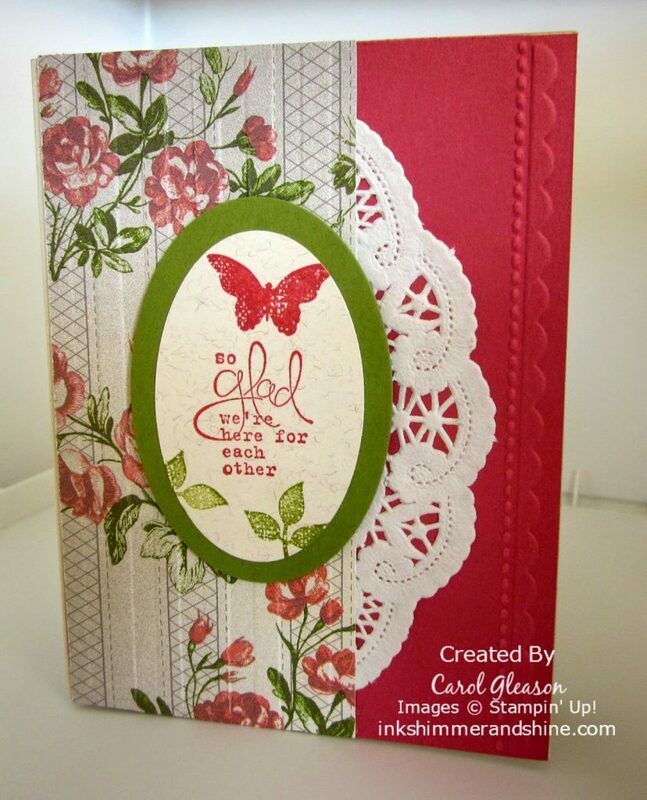 Lace doily – non-Stampin’ UP! Retired, Retiring Soon, and Still Here!